We were delighted to host our 4th Community Awards ceremony last night at our annual event. 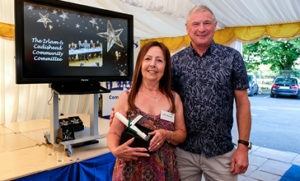 Our stars were applauded by nearly 120 people who attended the celebrations and were all pleasantly surprised with their unexpected awards. Alan Boyce was recognised for the amazing work he carries out as a Salford City Council employee trying to keep the streets of Irlam and Cadishead free from litter. He commits to engaging with the regular volunteer litter pickers, something which is invaluable in working as a team to improve the look of the district and constantly goes above and beyond in striving to improve the look of our district. The Evergreens are a ladies choir made up of local residents who meet in Cadishead. Their award was in recognition of the endless hours of entertainment and enjoyment that they have given to the community through their performances over the past 21 years! It is also admirable that whilst performing, they have also helped to raise funds for so many local groups and national charities. Fred Humphries received an award for the remarkable number of hours he gives freely as a volunteer for the Friends of Hollinfare Cemetery. His regular grass cutting since the group was formed in 2010 has had a huge impact on the look and feel of the cemetery. The Irlam and Cadishead Community Committee were recognised for the sterling voluntary work the members carry out. Working in partnership with Salford City Council, Councillors and the Police in helping to support the community, their commitment to addressing and influencing a diverse range of local issues and the support given to worthy projects is most admirable. The Irlam Male Voice Choir are another local choir also recognised for the entertainment that their members have given over the years! Their performances not only entertain many but again also help to raise funds for local groups and national charities. Jess Fletcher received an award in recognition of her work training the highly successful Salford Synchronised Swimming team based at Irlam Leisure Centre. Her dedication and commitment, above and beyond her role as a Salford City Leisure employee especially around competition time, has not gone unnoticed and shows in the team’s amazing achievements. James Parker’s award was our special way of recognising the wonderful work he has done and the funds he has helped to raise over the years as a Rotary member and Poppy Appeal Organiser. He has been instrumental in and involved in so many local, national and international projects and initiatives that it is hard to mention them all. Last but not least, Stacey Antcliff was recognised for leading the fundraising to ensure the much-needed refurbishment of the George Thomas Playground comes to fruition. Regeneration projects like this don’t happen unless someone commits their time and efforts to drive them on, work closely with partners and see things through to the end. Her unstinting efforts and the volunteer time she gives for the benefit of local children and their families is much appreciated by HDT and the district.